A team of scientists has finished analyzing rocks collected by the Chinese lunar rover Yutu in 2013 — the first geologic sampling effort to hit the Moon in forty years. The regolith is unlike any we’ve seen before, and it suggests that the Moon’s history is far more complex than we realized. The 1970s were the heyday of lunar geologic studies, with both the American Apollo (1969-1972) and Russian Luna (1970-1976) missions collecting and analyzing samples. Since then, we’ve continued to study the Moon’s surface from afar, using remote orbiters. Only in the past few years has the Chinese space program begun to pick up the “ground work”—and its efforts reveal how much we still have to learn about Earth’s nearest neighbor. Results from a lunar surface rover mission published today in Nature Communications indicate that the Moon’s mantle is far less homogenous than Earth’s, probably the result of major impacts roiling everything up billions of years ago. How exactly the Moon formed isn’t certain, but according to a leading theory, it was violent. Called the “giant impact hypothesis” or the “Big Splash,” the idea is basically that a primordial, Mars-sized planet crashed headlong into the Earth approximately 4.5 billion years ago, 20-100 million years after our planet formed. The collision sprayed massive chunks of molten debris into orbit, which soon coalesced into a new planetary body—our Moon. As it cooled, the Moon’s rocky materials separated into a crust, mantle, and core. But half a billion years later, a buildup of heat from the radioactive decay of elements in the Moon’s interior remelted parts of the mantle, creating a subsurface, rocky “ocean.” This triggered a period of intense volcanic activity and eruptions that lasted another billion years. The evidence for this period of heavy volcanic activity is stark: dark, basaltic plains—a so-called “lunar maria”— cover nearly a fifth of the Moon’s surface, and are most visible on the side facing Earth. The Apollo and Luna missions sampled basalt flows formed during the height of the Moon’s volcanic period. Chang’e-3, an uncrewed lunar lander carrying the Yutu rover, deliberately targeted something different. In December of 2013, it touched down in Zi Wei, a comparably young (<3 billion year) impact crater located on the northern edge of the prominent, lava-filled Imbrium basin. The basalt plains in this crater represent the very tail end of the Moon’s most eruptive era, when upwards of 95% of the mantle ocean had already re-solidified. The regolith—the powdery, weathered material that blankets the Moon’s surface—is thin and very similar to the underlying rock. As such, the crater offered an opportunity to peer into a later chapter of the Moon’s history. The simplest assumption is that the geologic story in Zi Wei would mirror what Apollo and Luna had found elsewhere. The truth turned out to be far more interesting. 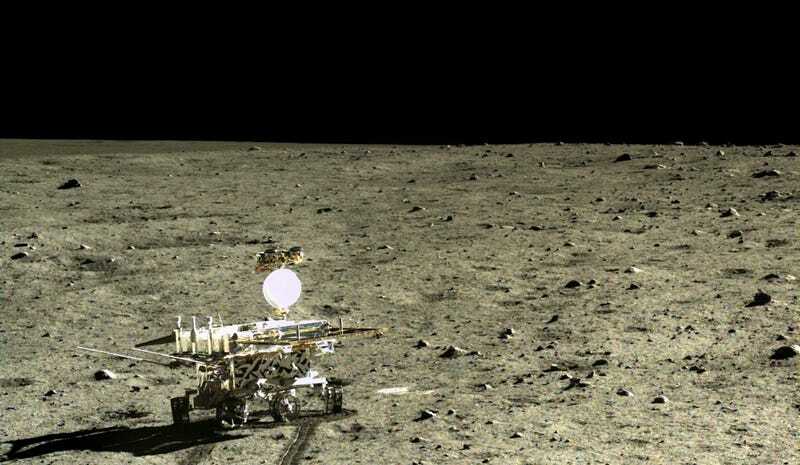 After Yutu collected samples of regolith, they were analyzed by the rover’s alpha-particle X-ray spectrometer and near-infrared hyper spectral imager. Several aspects of the samples’ mineralogy were unusual. First and foremost, they contained intermediate concentrations (4-5%) of titanium oxide, which was bound in the form of the mineral ilmenite (FeTiO3). With a relatively low melting point, ilmenite is one of the last minerals to cool out of magma. As it crystallizes, the dense mineral sinks into the mantle, forming regions of titanium enrichment. When volcanic activity flares up, you get basaltic outflows that are titanium oxide enriched (up to 15% by weight). But when magma rises in ilmenite-poor regions, titanium concentrations tend to be quite low. Both of these compositions (high and low titanium) were observed by Apollo and Luna. The new samples’ intermediate titanium concentrations, however, are a bit wacky. If the Moon’s mantle cooled uniformly over time, we’d expect a repeat of the story from before—either high or low titanium levels. Now, we’re starting to see a gradation in concentration. Of course, we already know of one period during which the Moon was intensely battered—the Late Heavy Bombardment, which took place some 4.1 to 3.8 billion years ago. But the frequency of impacts after the LBH isn’t well understood. In any case, the picture we’re building of the Moon is in stark contrast to the situation on Earth, where the mantle cooled relatively uniformly. While Yutu’s titanium data raises big questions about the Moon’s early history, the rover also helped solve a smaller mystery. Orbital data indicated that the Chang’e-3 landing site was rich in both ilmenite and the mineral olivine. Finding these minerals together is a bit strange, because olivine usually crystallizes out of magma much earlier. But Yutu showed that the olivine in Zi Wei is exceptionally iron-rich, giving it a much lower melting temperature. The discovery underscores the importance of ground-truthing remote sensing data with actual samples. In some ways, the study raises more questions than it answers. But if one thing is clear from China’s first lunar exploration endeavors, it’s that ground missions to the Moon are still well worth our time. Fortunately, this isn’t the end of the story for Chang’e. In addition to Yutu’s work, Chang’e-3 placed a robotic telescope on the Moon, and it’s been working beautifully ever since. Last year, China completed its first lunar return mission, when its Chang’e-5 test vehicle swung around the Moon’s far side before sending its (empty) sample return module back home. Eventually, China is hoping to not only land a probe on the far side of the Moon, but return samples to Earth.